There’s another source of money which is just going to start trickling into the system soon, however, which is less easily recorded and tracked. Independent expenditures are a form of campaign finance that had existed before 2010, but which blasted into stratospheric levels following the Supreme Court’s ruling in Citizens United vs. the Federal Election Commission. As opposed to the quite strictly limited funding that can be given directly to candidates – and less limited, but still regulated spending that can go to traditional political action committees (PACs) — this decision allows unlimited spending, by any person or corporation, with very limited disclosure requirements. This type of organization is known as a SuperPAC. So what was it, again,that the RGA brought to us in 2010? Through substantial ad buys and direct mailing, independent expenditures make a significant contribution to the nature of our campaigns these days through the addition of money which is unpredictable, difficult to track, and mostly from out of state. While it doesn’t yet track the true sources of independent expenditure money, Maine Ethics Commission does track the amounts of expenditures (although it can be tricky to find those reports since they’re not listed on the website’s regular left-hand navigation bar- this is the link.) 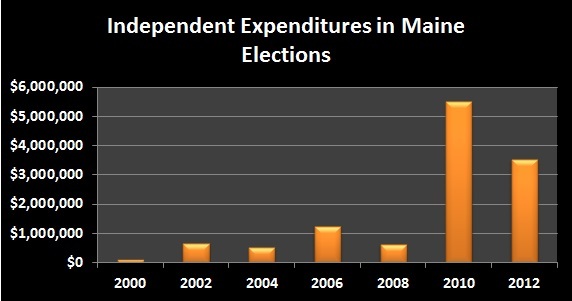 What looking at those reports demonstrates is the massive increase in independent expenditure spending in 2010. The decline in 2012 speaks to the fact that there was no governor’s seat at stake, but even so the amount that was spent in 2012 was about six times higher than the amount that was spend in 2008, the last comparable pre-Citizens United election. What’s also telling is the massive shift towards negative ads. Because independent expenditures are essentially strings-free, a candidate can “not coordinate” and have the SuperPAC get in all the licks against an opposing candidate that they’d like, all without any official responsibility. 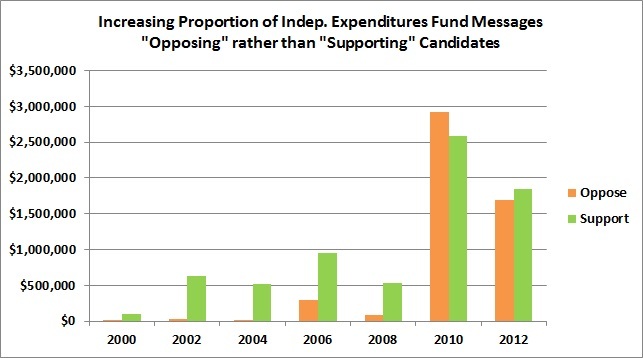 Negative ads by independent spenders have grown tremendously since 2010. SuperPAC ads can even completely lie about their targets with no consequences at all. In general, political ads are not held to any “truth in advertising” law because of strong free speech guarantees on political speech. You really can say whatever you want. However, candidates would ordinarily need to guard their reputations and be careful not to smear their opponents with untruths, for fear some of that mud might splash back on them. Unluckily for us, anonymous groups with ambiguous names have a lot more reputational freedom. 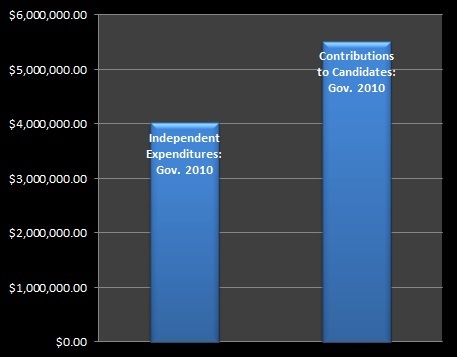 So where did these independent expenditures from 2010 come from? 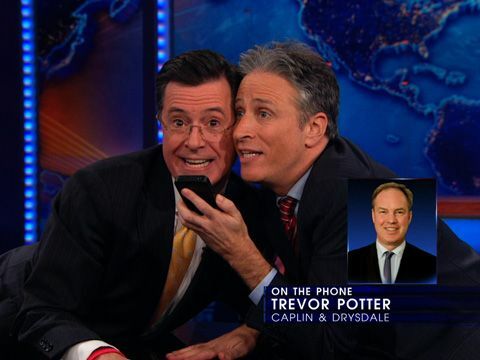 Knowing this will help flush out a significant part of the story of campaign finance in 2014. Based on what we saw in 2010 – where independent expenditures from faceless groups bought nearly as much campaigning as our disclosed donations to candidates – this is going to be an interesting story. This entry was posted in Campaign Finance and tagged 2010, gubernatorial election, independent expenditures, Maine, Republican Governors Association, SuperPACs. Bookmark the permalink.